Home Style Advice	Which Suit Style is Best for Shorter Men? 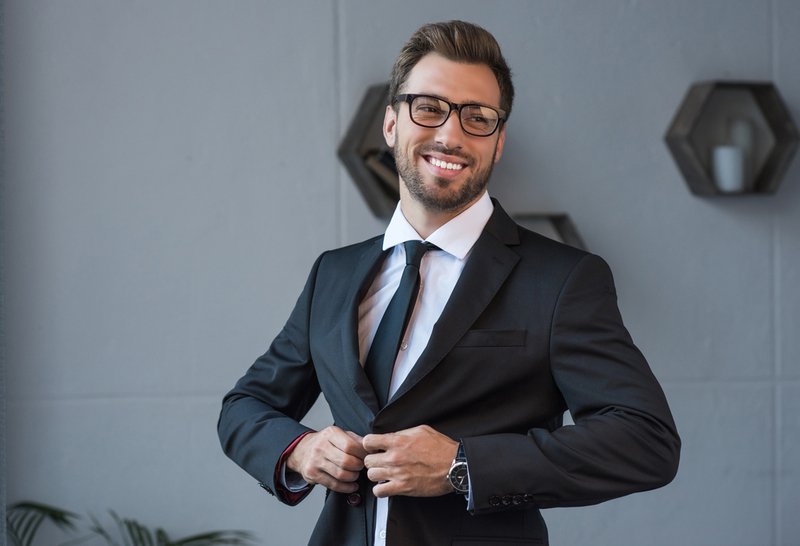 Finding business suits or formal suits for men who are shorter than average can be difficult, but once you know what style details to look for, it can be easy. Remember that every body type has its challenges when it comes to suit shopping, and suits for short men can always be tailored for length. After you find a suit style and cut that speaks to you, get it fitted to flatter your body. You’ll look (and feel) like a million bucks. But how do you know which suits are best for your body type? Here are our tips for finding suits for shorter men. If you want to look taller, look at the lapels, sleeves, button placement, and length of your jacket. Slim lapels will make your chest and shoulders look long and lean. Peak lapels are quite wide, so consider suits with shawl or notch lapels instead. Similarly, sleeves that hug your arms will make them look slim and long. If they’re too wide, your arms will look short and stout. Remember that the end of your sleeves should hit somewhere between the base of your thumb and wrist, with a peek of dress shirt showing. To look proportionate and make your legs look longer, find a jacket with higher button positioning and a slightly shorter length. Suit jackets typically fall to cover your rear, or the hem aligns with your knuckles. You can get away with slightly shorter jackets that will expose more of your leg, making you look taller. Waist buttons placed higher than usual will do the same thing, making your torso and legs look longer. Now that you’ve found suit styles that will flatter your body type don’t forget that fit is just as important. When you’re short, it can be easy to assume that you just have to deal with ill-fitting or disproportionate jackets. But a suit jacket straight off the rack will very rarely fit anyone perfectly! Find a jacket off the rack that fits your shoulders snugly. The seam should rest where your shoulder meets your arm. To test that, lean against a wall when trying on a jacket. The shoulder of the jacket and your shoulder should touch the wall at the same time. If the jacket hits the wall first, the shoulders are too wide. If your arm hits the wall first, the shoulders are probably too tight. Once you’ve found a jacket style and cut that suits your frame, you’ll want to find matching suit pants. When your suit jacket and pants match, you create a monochromatic look that elongates and streamlines your body. The eye moves up and down your outfit seamlessly, so you’ll look tall and lean. The fit of your pants is critical if you want to look tall and sophisticated. Choose slim, gently tapering pants with medium or high drop, which is the length of the pant crotch. If the drop is too low, your torso and legs will look small. Avoid pleated pants and cuffed hems, which can make your hips and legs look thick and stout. Finally, when getting your pants tailored, go with a partial break or no break at all. A full break may bunch up on your shoes and can draw attention to the length of your legs. Jim’s Formal Wear has suit jackets with notch lapels, ultra slim pants, and everything else you need for a flattering formal look — no matter your height. Browse our collection of styles online to find your perfect suit or tuxedo! Do You Know Your Suit Fabrics? What Color Should Your Dress Socks Be?